Some sewing experience is helpful. 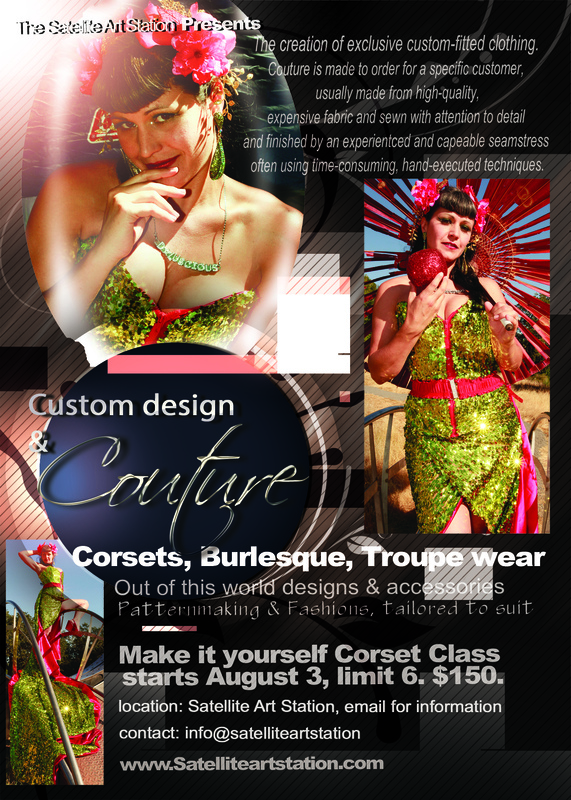 In this workshop you will design and make a custom fitted Corset. This includes: design and finalizing of a commercial pattern, sewing a mock-up, and then tailoring a finished corset. I teach a modified traditional approach to the corset that is fun, mostly easy and beautiful. We will cover concept, design, fabrics, flat patterning, construction and detailing. There will be video tutorials, and lots of excitement once were rolling. Please call me at (707) 824-4833 for a free design and fabric and trim consultation prior to the workshop so we can get right to work. Arrive ready to start to modify your pattern. Lots of one on one attention. Things to bring: Pattern, fabric, trims, notions: boning, busk, thread, buttons, zippers #10 sewing machine needles (they break a lot), snacks and good protein. Things included: water and popcorn are always free. Step by step instruction and hands on learning, access to workspace, sewing machines, grommets (from our stock), tools, equipment, video tutorials, resources and facilities. Overnights can be arranged if your from out of town. Like maybe you can cook for us as a trade or make a donation. The art station is home to Cats Eye Teahouse where there is always plenty of tea, coffee and drinks for sale. Class times: This annual and popular class tends to take over the studio for its duration, and includes open studio hours. We set the schedule together- It’s a little insane, but it works out well as each of you will need individual time and, not everyone is always available, and people sew at different rates, have creative designs that require more or less time, and have varying skill sets. You can schedule during any of the open studio hours, or by arrangement. Friday 11-6, Saturday 11-6, Sunday 11-midnight, Monday 11-midnight. Plan to make a commitment to the completion of your corset within in 2 weeks (it should take about 8 visits). The third weekend we can add trims and details- and do the photo shoot. This is an incredible deal and you will walk away with an item you will love forever, that you can say you made. Special: Custom Portrait of your finished Corset available for $75. more ($150. value) note: If you all plan the shoot in one day I will hire a hair and makeup person. You will get (6) 4×6 prints, 1 8×10 Print, and facebook and or email copies for social sharing. Remember: It is up to you to follow up about which prints you pick from the gallery. I will be offering another pinup playshop in the fall with Eva D’luscious. The creation of exclusive custom-fitted clothing. often using time-consuming, hand-executed techniques. After winning awards in College for her outstanding fiber art clothing, Heather started out in the fashion industry in NYC as in house designer for a small independent ready wear knit firm. As a result of this experience Heather holds an interesting approach to the the body, to art in modern times, the industry and adornment. She is qualified in traditional tailoring techniques, flat patterning, costuming for theater and performance art, readywear production, and home made clothing. Heather likes to re-fashion existing clothing and believs we should all make our own clothing, and that the readywear industry is part of a larger problem in society in which we are removed from the very basics that sustain us. Heather left the industry because it was so corrupt and continues to love fabrics, fashion and all things beautiful. She encourages you to never buy anything except Jeans (which you need special machines to make well), and of course shoes. New shoes. Never buy used shoes- it’s gross. Anyway you may or may not like her unique approach to fashion but you will make a rocking corset, avoiding all sweat shop labor, and other social i’lls. Especially if you find some cool used fabric from an antique shop.